Stolen pins become more and more of a problem. It is not only a bad feeling, seeing your carefully crafted images on Pinterest linking to shady websites and driving your hard-earned traffic to thieves. What is more: Stolen pins can seriously hurt your business. You lose traffic. You lose credibility. And you lose business! So, how the heck can you figure out if some of your pins have been stolen? And how can you find as many of the stolen pins – so that you can report them and have them taken down? Do you need some help with reporting the stolen pins you already found? Check out this guide to report stolen pins! How can you instantly see if a pin still links to the correct source – or is stolen? Simply, hover your mouse over the pin. The page it links to shows at the bottom of the pin. If this no longer links to your own website, your pin got stolen. The same way, you can identify if other pinners’ pins have been stolen. If you consider repinning a pin by a trusted blogger or media outlet, check the link of the pin first. If a pin from Social Media Examiner does not link to the Social Media Examiner website: Don’t repin it! If you still pin stolen pins, you risk being held responsible for spreading stolen content. If t happens once in a lifetime that is not so dramatic. But repeatedly repinning stolen content can seriously hurt your business. Here are 5 ways to find stolen pins. You should try them, poke around and see which method works best for you. When I see one of my pins showing up in my feed – and they often do, because I often pin my own pins🙂 -I always check if the pin is still linking to our own website. If not that pin is stolen. You may not have given much thought to the “similar content” section. 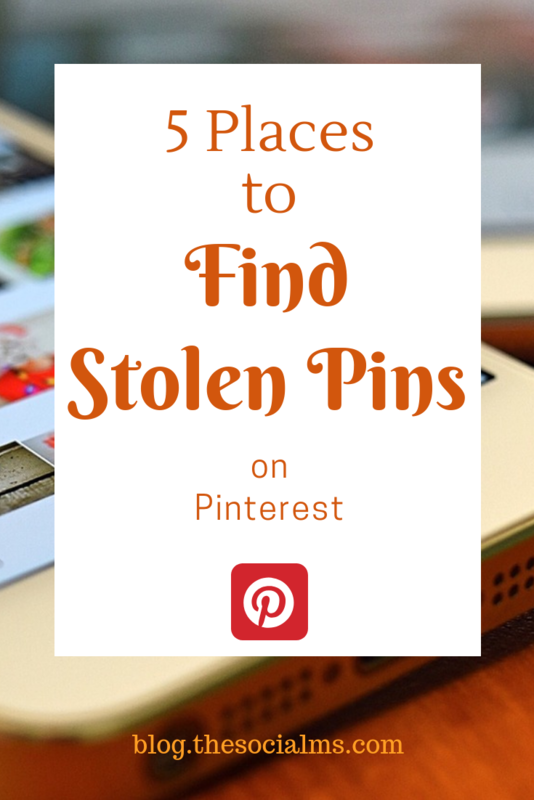 But when you try to figure out if one of your pins got stolen, it could be the place you want to look. This method to identify stolen pins is based on the assumption that most pin thieves steal pins that are already popular on Pinterest. Giving some additional consideration to your most popular pins could well mean you find the most important stolen pins. For this, you go to a pin. And click on the little symbol in the bottom right (the symbol you probably have wondered what it does…) This will give you a list of pins that are in some way similar to the pin you are looking for. You can even adjust the section of the pin that you want Pinterest to consider for the similar pin search. If you now hover your mouse over the images that show up, you can quickly see if the links of the pins are still correct or if one of them was stolen. This may be especially useful if you notice a drop in traffic for one of your pins and want to know if this is due to stolen pins. If you tend to use some niche hashtags – or even some hashtags that relate to your brand or website you can use these hashtags to find stolen pins. The reason is simple: Thieves tend to steal the pin by simply redirecting the URL but most of the time they do not change the pin description. The stolen pin will then still use your special hashtag. 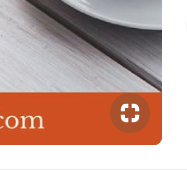 If you now click on the hashtag, Pinterest gives you feed of the most recent pins with this hashtag. The more specific the hashtag is for you and the less other people use this hashtag the easier it is to use it to identify stolen pins. But it is still worth to look at the hashtag feed once n a while for the hashtags you mainly use. You could be surprised how may stolen pins are floating around. If you are trying to get traffic from Pinterest – or if you already get tons of traffic from Pinterest, you are probably aware that Pinterest is not simply a social network. Pinterest is also a search engine. And that means some of the traffic power on Pinterest comes from search. If you are doing things right on Pinterest, some of your pins hopefully rank fairly high for some common search terms on Pinterest. And a large part of your traffic from Pinterest comes from these high ranking pins in the search. And that makes the Pinterest search the one place where you want to make sure that no stolen pin is take up the space that your original pin should take up. That would mean losing traffic – and success. So, if your pins already rank for some search terms, check the search results once in a while to make sure that no one is stealing your spot on the search results from you. For every pin that you view there is a section “More like this” below it. In this section, Pinterest shows you pins that they believe are in some way related to the one you are viewing. If you regularly pin content around the same topics, this is also a place where you will most likely see some of your other pins. Again, you should check if these pins still link to your website – and report them if they are stolen. Basically, every place that you want your pins to show up, you should check if the pins that are shown still link to your website – or you will lose the traffic that you worked so hard for. I have also been asked if it is really worth the effort to report pins. And I totally agree that reporting pins is an annoying and time-consuming task. If you do not report your stolen pins, more and more of the marketing juice that you acquire on Pinterest will go to someone else. And that is not only frustrating it is going to hurt your business.